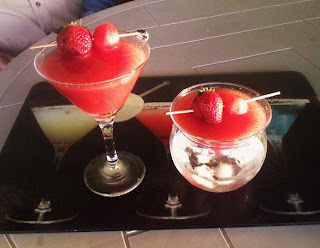 STRAWBERRY WATERMELON MARTINI - Summer Martini! Yes, I know it's a little early for summer in most of the U.S. but here in Arizona the heat comes early and we had 90 degrees here the other day. Fortunately I had some fresh strawberries and a cute little seedless mini watermelon all nicely prepped and cold in my fridge so out they came along with some fresh mint and I was shaking up some cold and refreshing Strawberry Watermelon Martinis for my new neighbors at Happy Hour! I think this martini put me in good standing with my new neighbors - they now know to keep an eye out for my martini flag. . .that means it's time for Happy Hour at the home of The Martini Diva!